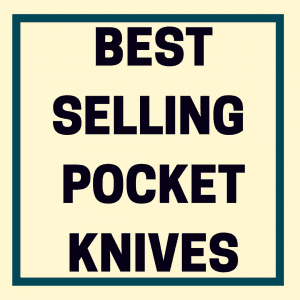 You are here: Home / Pocket Knife / What’s the Best Pocket Knife of 2015? Though we’re still in the first half of 2015, most of the excitement, at least for us knife aficionados, is already over: SHOT Show has come and gone, and IWA too, and while there will be some sporadic releases for the rest of the year, most of what was seen at the big shows is already on the shelves. All in all 2015 has been a quiet year for the pocket knife, but that’s not to say that it’s been a bad year. 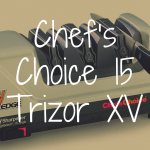 There were many quality offerings from most of the major manufacturers, and what 2015 lacked in innovation I think it certainly made up for in refinement: the best knives of the year are almost all variations on existing designs, but variations that fixed problems or peculiarities with the originals. Zero Tolerance is on fire. 2013-14 saw the high-profile collaboration between ZT and Rick Hinderer bear fruit in the form of a series of knives that combined the extraordinarily high build quality and robustness of Zero Tolerance with the distinctive design language of Rick Hinderer. These knives—the 560, 561, 562, and 566—established the benchmark for what consumers could expect from a high-end production folder. At SHOT, ZT debuted another Hinderer collab. The ZT0450, a Dmitri Sinkevich design, also stood out amongst these new designs as the one to watch, and upon its release did not disappoint. Its 3.25” blade is much more reasonable than the standard ZT behemoth for everyday use, and, at 2.9 oz., is something that you are hardly going to notice is in your pocket. It clearly echoes the Sinkevich design language with a slender profile and a blade that is simultaneously aggressive and elegant. Coolest of all is the fact that the knife is clearly designed to accommodate the after-market knife modding community; the construction is simple and straightforward, and it’s only a matter of time before we see all sorts of cool replacement clips and scales for this knife. 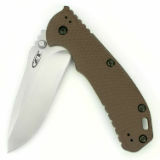 This shows that ZT understands and respects its fans, and wants them to enjoy this knife the way they want to enjoy it. The one downside to the 0450 is that it is an awkward flipper (as noted in this video breakdown); it requires one to position their hands in a very specific way if they don’t want to aggravate the detent and stop the knife from deploying. This is a shame, and almost a deal-breaker. I still think that the 0450 deserves a spot on this list, but I will note that if ZT had addressed this issue it would be much higher up on it. Benchmade has had a slow couple of years. They seem stuck in a rut of bland, stereotyped designs that, while functional, are neither exciting or, frankly, relevant. 2015 was similar, except for one knife, the Benchmade Valet. The Valet is a small knife, which is a design category that Benchmade traditionally has problems with (with the exception of the wonderful Mini Griptilian). Here they are trying to address that weakness head-on, with a knife that is made of top-shelf materials. 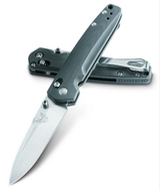 The Valet sports contoured gray G10 scales, sports an Axis Lock, and is made out of M390 steel, a super steel that possesses superior edge retention, corrosion resistance and adequate toughness. Getting all of this for $170 is reasonable, too, which is refreshing, as Benchmade typically goes steep on the prices for their blades; like ZT, it seems that they are listening to the common complaints their fans have, and trying to address them. The Valet has had some QC issues in its first few months on the market, but that is, unfortunately, not uncommon for new knives in general, and new Benchmades specifically; the 940-1, when it released last year was all over the place, with some blades being pristine masterpieces and others basically falling apart out of the box. The Valet should get more consistent the longer it stays in production, particularly if it’s selling well (which I believe it is), and, if worse comes to worse and you purchase a Valet that is garbage, Benchmade does have excellent customer service, and will get you taken care of. It should be a testament to the quality of the Valet design that, despite that fairly large caveat, it is still one of the best blades of 2015. The Native 5 has been around since 2012, but recently it was quietly upgraded to S35VN steel, so it does technically qualify as a “new” knife. Nitpicking aside, it is spectacular. The Native 5, which is marketed as an affordable, totally-made-in-the-USA blade, should in my opinion replace the Delica line as the flagship Spyderco pocket knife. It addresses all the problems present in the Delica with aplomb: it integrates a forward choil, does away with the useless finger grooves, upgrades the steel, and is narrower in the pocket. It is one of those rare knives that can be called upon to do basically anything you need it to do, and do it well. There is a strong argument to be made for it being the best pocket knife at or under 3” that Spyderco makes. All of this can be had for under $100, and sometimes as low as $60 or $70 depending on where you look. 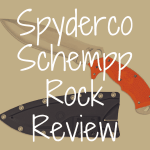 While it is somewhat sad that an old knife with a new steel is likely the best thing Spyderco will release this year (although I do have hope for the Lil’ Temperance 2), it’s a knife that I feel has never gotten the attention it deserves, and now is a better time than ever to check one out. This is a similar story to the last, in that it is a knife that has been around for a few years simply given a fresh coat of paint (both figuratively and literally; more on that below), but Cold Steel has been making huge, important changes, and they deserve acclaim. The previous American Lawman ran AUS-8 steel, like most Cold Steel knives. It is a good steel but definitely not competitive in the mid-price folder market. For 2015, Cold Steel refitted all their standard designs—the American Lawman, the Voyager series, the Code 4, and the Recon 1—with CTS-XHP super steel. 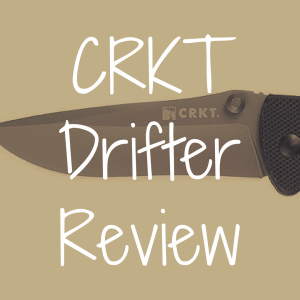 This is not an incremental upgrade: CTS-XHP is considered one of the absolute best steels for pocket knives today, and outstrips AUS-8 in every category except for ease of sharpening, and even then it is not the hassle that many of the other super steels are. Additionally, Cold Steel finally—finally!—got rid of their horrible Tuff-Ex blade coating and began using industry-standard DLC. 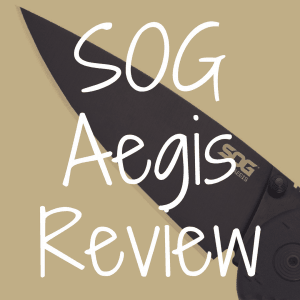 Talking about the 0450 and the Valet, I gave ZT and Benchmade credit for listening to their fans; Cold Steel listens too, and the improvements they made to their products in response to what they heard are amazing, and turned good blades into great ones. The American Lawman is named here because it is my personal preference amongst Cold Steel’s lineup, but the whichever CS knife you prefer, it has been improved for 2015. Great Eastern Cutlery is the youngest company on this list. They began in 2006, in Titusville, PA, with the goal of making traditional American pocket knives using some of the same tools, materials, and methods as were used 100 years ago. In short, they were purposely walking out of step with the current trends in the knife industry. And yet, 9 years in, GEC has not only garnered fans within the traditional knife community, but is rapidly gaining ground with users of all tastes and preferences. Like I said, they’re all winners, and you can’t go wrong. If you carry a knife every day, and haven’t ever tried a really great traditional knife, you need to go out and experience a GEC for yourself. GEC is at the peak of its form, routinely turning out knives of the highest caliber. Although the patterns it builds are often very old, GEC’s attention to detail and insistence on quality puts them in the very forefront of the cutlery industry today. 2015 was more of a refinement than a revolution, but that refinement is an important testimonial. As the five manufacturers in the list above show, knife companies are listening to their fans, and their designs and incremental improvements reflect that. More than many industries, the world of cutlery is a dialogue between the designer and the user, and I think it is impossible to look at knives in 2015 and not be excited about where that conversation is taking us. 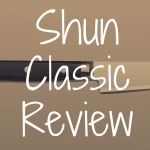 For more great reviews of pocket knives, be sure to bookmark Reliable Knife! 1) What’s the Best Kershaw Pocket Knife? 2) What’s the Best Assisted Opening Knife? 3) What’s the Best Mora Knife? 4) What’s the Best Bowie Knife for Survival? 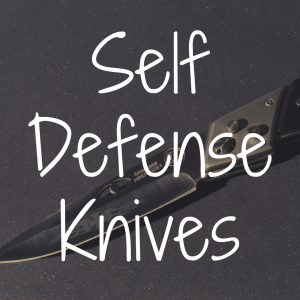 5) What’s the Best Ka-Bar Knife?